I love spring. It means that summer is on its way. In Denver, spring often brings giant, messy, wet snowstorms in March and part of April, but here we are at the end of March and it feels like early summer already. I’ve seen crabapple and cherry trees blooming; and can smell the flowers from twenty feet away. The days are noticeably longer and much warmer. Spring puts me in the mood for bright, fresh flavors. This time of year, when I begin to spend more time outdoors and less time keeping a watchful eye on the oven, I look for meals that are flavorful, filling, and fast. Salads are an easy spring/summer dinner and the combinations are truly endless. Growing up, we ate a lot of iceberg lettuces salads, with halved cherry tomatoes, squares of green bell pepper, and cool, crunchy discs of cucumber. Preparing dinner for a family of seven, we made big salads and always had a few options for salad dressings within reach. I have never been a fan of ranch dressing. I know this may alienate some of you, but I do not get the appeal. For a long time, I would just eat salads dry. I couldn’t find a dressing I really liked. I’ve made ranch dressing a few times, from scratch, not a Hidden Valley Ranch envelope, and haven’t been convinced. These days, the salads served at my parents’ house are pared down and grown up. 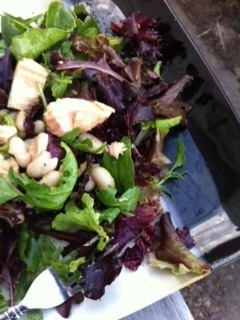 Mixed greens, homemade dressings, and varied vegetables make it into the bowl. In Bon Appetit magazine’s April 2012 issue, Meryl Rothstein penned a story about parsley, with an easy recipe for White Bean and Tuna Salad with Radicchio, page 49. The dressing for the salad is parsley vinaigrette. I was intrigued. 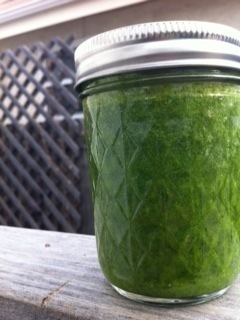 I like parsley, but I’ve never used it in a salad dressing. The ingredients nearly sang out to me: flat leaf parsley, olive oil, fresh lemon juice, champagne vinegar, garlic, and salt and pepper. Bright, vibrant, and simple ingredients turned into a gorgeous salad dressing – perfect with the tuna and radicchio, it tastes like spring. I made the salad, dressing included in less than 15 minutes. I made a few changes to the salad. I omitted the celery because I don’t like celery. If you do like it, I encourage you to put it in your salad, mine definitely lacked crunch. I used a spring mix containing red and green Romaine, Mizuna, red and green chard, baby spinach, frisee, arugula and radicchio. I still have the jar of dressing left, and I think I’ll make the salad tomorrow for lunch. Maybe for dinner I’ll roast some halibut and spoon the dressing over it. If you get a chance, head over to Bon Appetit and check out their other dressing recipes, or on page 88 of the magazine. You may never buy bottled again. Photos, top to bottom: the finished salad, my leftover dressing, and the ingredients in my mini chopper. 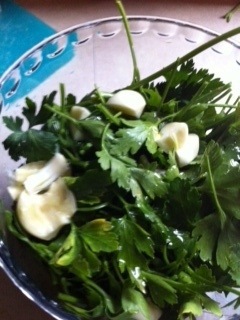 You should use whole parsley stems.